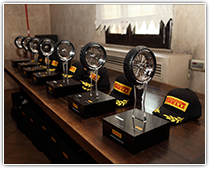 Around the world with the innovation, sustainability, quality and service level for the Pirelli Supplier Award 2015. 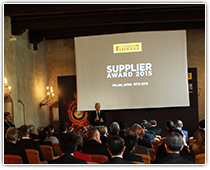 The nine best suppliers 2014 awarded by Pirelli Purchasing Department come, in fact, from six different countries: Italy, Germany, Indonesia, China and Japan. The companies which were handed the prize were Hogg Robinson Group, Promoidea, Fincons, Kirana Megatara, HF MIXING GROUP, Hamburg Sued, JSR Corporation, Cordenka Gmbh and Shandong Yanggu Huatai Chemical. The awarded suppliers come from different sectors, ranging from event and travel planning to IT consultancy services, from logistics to natural or synthetic rubber production. Pirelli greatly values the collaboration with its suppliers, which are considered essential business partners to achieve the corporate strategy, more and more focused on the Premium segment. Pirelli’s Purchasing Department comprises 177 experts from all around the world, 40 of which work at the headquarters in Milano Biccoca. Each year they work with 12,000 suppliers selected on criteria such as security, innovation, materials quality, sustainability, risk level and supply chain efficiency, with an analysis focusing not only on the direct suppliers but also on their own suppliers.